Brodie has chosen to join Crawley's "project promotion"
Crawley Town have completed the signing of York City striker Richard Brodie for an undisclosed fee, just three minutes before the August transfer deadline. The 23-year-old, who scored 26 league goals for York last season, teams up with joint top-scorer Matt Tubbs. The Red Devils have signed 17 players since May during a spending spree. Crawley manager Steve Evans told BBC Sussex: "He's a goal-scorer, but he also works very hard for the team. He complements our squad very nicely." Evans says the plan to pair Brodie and former Salisbury striker Tubbs has been a summer-long project: "I spoke long and hard to our defenders, as well as seeking counsel from other people. "The defenders said Brodie and Tubbs independently were a right handful, and they would welcome having them on board. That's the biggest testament that you can have." But Evans also does not want any of his six strikers thinking they are automatic choices: "We still have Craig McAllister, we still have Jamie Cook, and we still have Ben Wright. "I'm an honest manager, and whatever two or three strikers start each game then they'll deserve to start on form and not based on reputation. "Naive managers would put those two together on Saturday, and that's not necessarily the case." York City manager Martin Foyle has expressed his disappointment at losing Brodie, although he felt it was the right decision. Foyle told BBC Radio York: "Obviously you're a little bit disappointed to lose your top goal scorer. "But from a club's point of view it was a decision to accept it. From my point of view you've got to get on with it. "You've got to look at all equations. You couldn't afford to make the same mistake as before with Clayton Donaldson who went to Scotland and the club got no fee for him. "So we've got to look at the books and the overall picture and it's probably the right decision that the club has got to make." 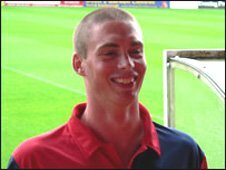 Brodie joined York City from Newcastle Benfield midway through the 2006-07 campaign. The England C international scored 34 goals in total for City last season which is the third best tally in the club's history. Foyle said the decision to move to another Blue Square Bet Premier club was that of Brodie's. "I work for York City and can't get involved in that," he said. "I can give advice to certain players and try and help them with their careers but it's Richards decision at the end of the day and we've got to get on with it. "The loan window opens in over a week's time so that's something that I've got to use. "Hopefully we can get somebody in because we certainly need somebody in."